Peacefully at Lee Manor, Owen Sound on Tuesday March 19, 2013. The former Beatrice Irene Greig at the age of 94 years. Loving wife of the late Donald "Don" Pruder for over 51 years. Cherished mother of Joy and her husband Barry Smith, of Georgian Bluffs. Devoted grandmother of Jeff and his wife Michelle and Jolene and her husband Mark Morrow; and great-grandmother of Laney and Maddox Smith and Marlee Morrow. Sadly missed by her sister-in-law Leona Greig and her many nieces and nephews. Predeceased by her parents Charles and Carrie; brothers Grenville, Bev and his wife Helen, Rae and his wife Jackie, Wilfred and his wife Muriel, and Clarence; daughter Isabel; and grandchild Ryan Smith. Beatrice had a great love of family and genealogy and was a Charter Member of the Purple Valley Women's Institute. 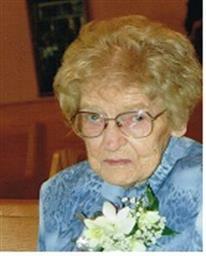 Family invite you to gather for visitation at the Thomas C. Whitcroft Peninsula Chapel, 272 Berford St., Wiarton (519) 534-5341 on Sunday, March 24, 2013 from 2-4 and 7-9, where a service to celebrate Beatrice's life will be held Monday at 1 o'clock. Spring interment in Colpoy's Bay Cemetery. Donations to the Purple Valley Women's Institute would be appreciated.